Over the next few weeks, we’ll be celebrating the release of the 200th episode of my podcast, Accelerate!. Since it’s introduction on Oct 5, 2015, you’ve helped Accelerate! become the go-to resource for insightful, educational, motivational and entertaining interviews with world-class experts on a range of subjects that all contribute to helping you accelerate the growth of your sales and your business. 6 days a week we’re providing valuable insights and strategies you can’t afford to miss. I’m marking this milestone by highlighting the most popular episodes we’ve published so far on Accelerate! The experts on these episodes hold a range of opinions about the best way to maximize the effectiveness of your social selling. However, irrespective of which approach you favor, I guarantee that you’ll learn something new to help you become more productive by listening to each of these episodes. The episodes are listed below in order of popularity. Enjoy! Please take a minute to share this article. Thanks! This was a special episode of Accelerate! about Microsoft’s proposed acquisition of LinkedIn. I asked three leading experts on LinkedIn, Miles Austin, Kurt Shaver and Viveka Von Rosen to share their perspectives about what this proposed acquisition will mean for sales reps and sales leaders. CLICK HERE to listen to this episode now! CLICK HERE to listen on iTunes. Tim Hughes, one of the world’s leading experts in social selling, is the founder of Digital Leadership Associates, author of Hacking the Buying Process and co-author of a new book called Social Selling: Techniques to Influence Buyers and Changemakers. In this episode, I talk with Tim about the five-stage social sales methodology he has created to drive B2B sales. Tune in to hear how you can use social selling at every stage of sales process. In this episode, Shane Gibson, author of Sociable and Guerrilla Social Media Marketing, and host of The Social Sales Podcast, shares best practices for using social selling to build the relationships and stimulate sales conversations with decision makers. CLICK HERE to listen to this episode now! Jack Kosakowski is the global head of Social Sales Disruption at Creation Agency. He works with B2B companies to infuse social into the traditional B2B sales process. In today’s installment, I chat with Jack about how to use social media to add value to prospects as they navigate their way through your sales funnel. Viveka von Rosen is a leading social selling expert, and the author of LinkedIn Marketing: An Hour A Day. In today’s episode, Viveka and I talk about how sales teams should use social selling in general, and LinkedIn, in particular, to initiate and build stronger relationships with their prospects and clients. 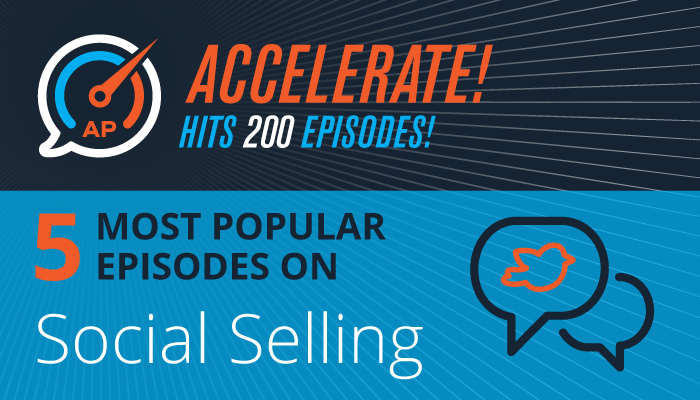 If you’ve missed any of my previous episodes of Accelerate!, CLICK HERE to view a list of my entire catalog of more than 200 interviews with leading sales experts and thought-leaders.